God has really shown me His favor over the last few days! I am so extremely blessed to be His child and very excited to be part of His team — making Him known and striving to show His love to others. This past Wednesday night, the spiritual warfare began. It was heavy upon me and I couldn’t seem to shake it. I felt alone, I mean, I knew God was by my side, in fact He felt very close but I felt that I was facing something that no one else, up to that point, had gone through. I opened my email and there it was, an answer to my prayer. A friend I had been confiding in shared with me a story of someone they had read about that was facing the same battle. In that very moment, I felt a chain break around my heart and mind. I am not alone in my struggle. I just wept. I was in such a dark place and I was just crying out to the Lord. I wanted deliverance and the Lord to set me free. As I was sitting in my chair weeping, a friend texted me asking if I was okay. It was clearly from the Lord. Later, she said that she had been burdened to pray for me all week. I had been heavy on her heart and she was not sure why. Now we knew. After reading the email, letting the tears out and texting a few friends, I began to feel better. It felt like a very special moment. Let me pause this story to give you some background. I had been in need of $3,000 to continue my flight training. The goal was to finish my pilots license by the end of the year when my written test expires, but I lacked the funds. I sensed that the Lord would provide but I was not sure how. I did know that I should be receiving some travel reimbursement from the military from my time in Utah but I had no idea how much I would receive. I expected that it might be somewhere between $50 and $2,000 — a huge range. I had received an email confirming that the reimbursement had been processed and I was surprised at what I saw. I didn’t say anything to anyone. I wanted to make sure I understood the email correctly. I wanted to see the funds in my bank account. So there I was Thursday night, after the broken chain, tears and encouragement from others, I felt like I should check my bank account. There it was– a deposit of $4,582.60!!! I was instantly filled with an overwhelming joy. I felt like God just said, “I love you and you are going to make it.” I was so in awe of Him!!! Apparently, God was not done blessing me yet. The next day, while I was closing out my day at work, a customer came in to see if we could look at his airplane. Something minor had broken when he landed and he was hoping we could take a look at it. 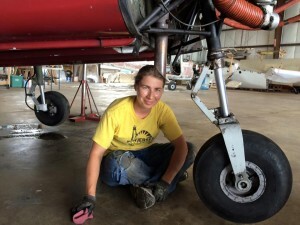 While his plane was being looked at, we were able to talk for a little bit and he asked me if I was enjoying my time working toward my mechanics license. I said something about wanting to fly but how I had run out of money. I also mentioned that I had just received more funds but I don’t know if he heard that. After his airplane was repaired, he asked the director if he could take a student up flying and Jon said, “yes.” The pilot pointed to me and told me that we were going flying. It was such an unexpected blessing! It had been 3 months, almost to the day, since I had last flown. As it turns out, the pilot was actually a flight instructor who trains airline pilots on the Boeing 737. I was shocked! He gave me several compliments and reiterated those to Jon when we got on the ground. It was such a boost of confidence. Once again, I felt like God was saying, “I love you.” It was such a special time. Since then, I have been able to share my passion and ministry with many people who seem to be excited about this journey the Lord has me on. God is doing great things! I plan to start flying this week. The plan is to fly 2-3 times per week. I will be flying after work on Tuesdays and Thursdays and when I can on Saturdays. I would appreciate your prayers as this time will be demanding. Thank you all for your continued prayers. I hope this letter shows you how powerful prayer and encouragement are. I pray that we would all go out of our way today to encourage one person. The world would be a happier place if that became a pattern. I know that being on the receiving end of that is priceless. It was a good week. We got a lot accomplished in the hangar and my family got to visit last weekend for Emma’s birthday. She is 6 years old now! It was very special to spend some memorable time with her. We spent time doing one of her favorite things– swimming. The family enjoyed time together at the lake on Saturday. Emma used my hands as a diving board as I propelled her up out of the water. She loved it! On Sunday, Ben (her dad) and her grandparents were able to join us for more time at the lake. The entire weekend was fun. We went to a small train museum, ran errands and had a family meal on Sunday afternoon. It is always nice to spend time together. As far as work in the hangar, I was able to remove a magneto, do more airplane paint stripping, participate in several annual inspections, remove and replace a couple of starters as well as a voltage generator. I am sure there was more that kept me busy but those are the things that stick out in my mind. Well, I hope you all are doing well. (Notice I didn’t say ya”ll, aren’t you proud of me?) Thank you for your continued support. It means so much! Well, stand firm, always abounding in the work of the Lord.